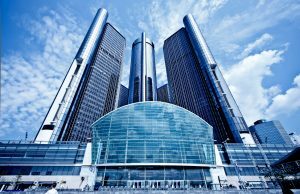 as its credit rating dropped to just above junk status and its share price to under $30, suggests that GM’s problems may be indicative of broader problems with many so-called blue chip companies. Their codependent pension plans may eventually bring these giants to their knees, as an aging work force means more retirees on corporate pension plans per currently-employed worker, much like the troubles Social Security faces. Investors are warned to be careful of these once-mighty blue chips and to question traditional buy-and-hold investment strategies. The Dow:gold ratio is presented as an indicator for asset class changes from traditional blue chips like GM to precious metals.